The plank can be performed anytime during your workout. Do it before a lift to heat up and activate your shoulder, glute, and core muscles. Or work it in as a finisher to really smoke the system and target your abs. Some of the following variations can even be incorporated in the middle of your workout, either as straight sets or as part of a circuit. Traditional Plank: This is the OG plank. Perform it for better core stability and improved posture, as your forced to keep your shoulder blades back and your hips straight. Do it – Get into a pushup position – either on your hands or forearms – and then tighten your core. Your feet should be shoulder width or narrower, and your back and hips should be in one straight line. Tense every muscle in your body. Perform for 3 sets of 20 seconds. It should be a very hard 20 seconds. Plank Banded Adduction: This move complements the banded abduction quite well. Also, it’s a core blaster that’ll target and strengthen the groin area. Do it – Loop a band around a stationary object and put one leg through the band loop. Set up in a plank so that the banded leg is closer to the anchor location. Then slightly lift the banded leg off the ground, open your legs, and guide the banded leg toward the anchor. When you reach your maximum range of motion, drive your banded leg back toward your body and squeeze it against your grounded leg. Repeat for 3 sets of 10 reps for each leg. Plank Banded Row: This plank combo challenges your balance and helps develop your lats and biceps as you pump them up with each rep.
Do it – In a plank, about a foot away from a band looped to a power rack, drive your elbow down toward your rib cage, squeezing your lat. Slowly extend arm back out. Do 3 sets of 10 reps for each arm. Plank Banded Abduction: This variation adds a rotational element to the traditional plank hold, which is great for lower-body prehab work, glute development, and knee stability. Do it – Loop a band around a stationary object. Before you get set in your plank position, step one leg through the loop, just below the knee. Drive the banded knee out wide, using the glute to squeezee it at the top. Repeat for 3 sets of 10 reps for each leg. Plank Plate Pull Through: The advanced variation of the plank challenges your stability on another level as you pull a small plate across and underneath your body. As a bonus, your shoulders will get a pump. Do it – Start in a normal plank position, with a plate on one side of your body. Brace your core and then reach underneath yourself with the arm opposite the side the plate is on.Grab it and then pull it through. Repeat for 3 sets or 10 reps on each side. 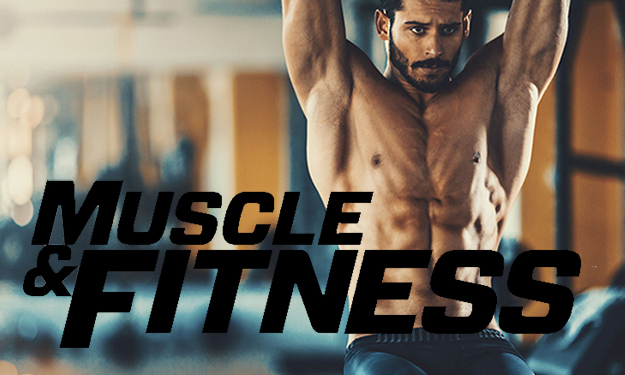 Check out Muscle & Fitness’ 18 Tips for 2018! Tip #12 Features Move Every Way by Chris Gray. “In the kitchen, a balanced meal is important. In the gym, a balanced workout is vital too. As Chris Gray C.S.C.S., a performance specialist at Ignition APG (www.ignitionapg.com), points out, the six main movements that humans use on a daily basis are push, pull, squat, hinge, carry, and rotate. Aim to incorporate all these motions in your training week to unlock your best body. Gray recommends this workout, which covers all your movement basis: overhead press (push), bent over row (pull), front squat (squat), Romanian deadlift (hinge), farmer’s carry (carry), and medicine ball twist (rotate).